Lucretius was a Roman poet and philosopher who wrote “De rerum natura” (On the Nature of Things), an epic poem widely regarded as one of the most influential works in history of literature, philosophy and science. In addition to his doctrinal and scientific impact, Lucretius exerted a profound influence on countless later philosophers and scientists. Very little is known about the life of Lucretius. He was born in 99 BC, according to most accounts. Jerome, a prominent Roman clergyman writing four centuries after his death, wrote that a love potion had driven him insane and that Lucretius had eventually committed suicide. Jerome’s account may well be simple fable, but Lucretius’ poem shows that he was a keen observer of plants and animals and knowledgeable in matters of nature. This suggests that he was familiar with the countryside, perhaps as the owner of a country estate. 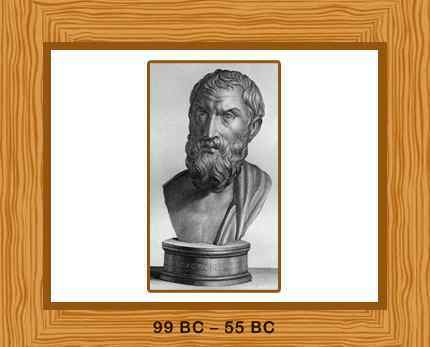 He was a follower of Epicureanism, is a system of philosophy based upon the teachings of the ancient Greek philosopher Epicurus, founded around 307 BC. It emphasized the goal of a happy and content life. His only known work is his didactic epic poem, “De rerum natura” (On the Nature of Things), that consisted of six volumes and conveys the ideas of Epicureanism. He wrote about diverse things such as atoms and the void, our modes of perception, and our will. He discussed the origin of the world and life, the causes of earthquakes, while reflecting on art, language, science and religion. The poem also talked about a variety of diverse scientific topics such as cosmology, mental illness, nutrition, clouds, the seasons, eclipses, magnet and poisoning. Lucretius was one of the first persons to discover that everything in this universe, ranging from planets and stars to mountains, decay. Centuries before the second law of thermodynamics, he predicted that one day “the walls of the sky will be stormed on every side, and will collapse into a crumbling ruin … Nothing exists but acorns and the void.” He rejected the idea of after-life, and stated that the body was made up of atoms and governed by the laws of nature. The poem begins with a famous invocation to Venus and sets out the major principles of Epicurean physics and cosmology. Explains atomic motion and shapes. Demonstrates the atomic structure and mortality of the soul. Gives a comprehensive account of Epicurus’ theory of vision and sensation. This begins with a tribute to Epicurus and is then concerned with cosmology and sociology, the poet explaining the creation of life on earth and the origin and development of civilization. This book concerns itself with explanations of meteorological and geologic phenomena, particularly thunderstorms, lightning, and volcanic eruptions. Lucretius died in 55 BC. He was around 44 years old.